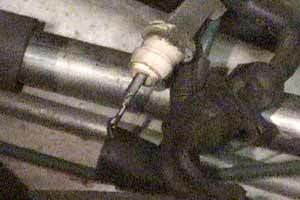 In late January 2000, I decided to check my oxygen sensors. I was getting reasonable fuel economy, but as I was about to take the car for its bi-annual California SMOG certification, I figured I should check them out. Using an oscilloscope, I found them to be "sluggish", so I decided that I should replace them. Imagine my shock as I called up a local autoparts store to inquire about the part only to find that they wanted US$299 apiece for them! These being the same parts for which the Jaguar dealership only wanted US$169 each. Of course, none of the various generic O2 sensors mentioned on the Jag-Lovers list appeared available at these stores, or the prices varied considerably from what people said they'd purchased them for. 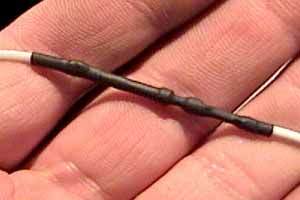 So off to the parts store to locate an appropriate - and cost-effective - replacement part. 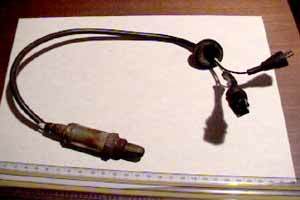 What I found was a bosch 3-wire sensor for an '89 Ford Thunderbird (BOSCH #13942), at a cost of about US$45 apiece. Had I been able to obtain the mating connector (a trip to a salvage yard with a pair of wire snips would have quickly resolved it, but the salvage yard is a trip I didn't want to make, and I didn't want to wait for a weekday for the Ford parts department to be open to place an inquiry with them), I probably would have simply retrofitted this to my original wires and been done with it. However, I ended up modifying the sensor to fit my car in such a way that I could still replace it at a later date without having to do any more soldering. 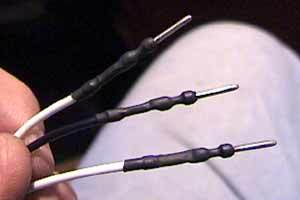 While the number of pictures here makes it seem like a lot of work, it really isn't, especially if you already have some basic components at your disposal (for instance, shrink tubing is something I keep a variety of on-hand because it is quite indespensible for recreating insulation on splices). Besides the two new oxygen sensors, and the harnesses from the originals, you need only some suitable insulating material (fibreglass cloth tubing), some small female molex connectors (sue me, I didn't note what size - but a trip to the electronics store with the replacement sensor in hand should quickly identify the size you need - after all, that's what I did), some shrink tubing, soldering iron and solder. If you don't mind resoldering the mess the next time you need to replace the O2 sensors (60K+ miles from now, if things go well), you could skip the whole molex pin bit. In my case, I decided that once I made this conversion, I wanted to minimize any future work expenditure in this area -- if I have to replace the O2 sensor again, I can pick up a replacement (for a Ford T-bird), remove the wires from the connector (PINS intact), and plug it into the insulated molex connectors - all I'd need to do is properly shrink on some heat shrink tubing on the pins for the new sensor, and that's a trivial task easily accomplished with a pocket lighter. 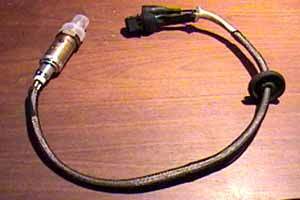 A document on diagnosing O2 sensors. Use of DSOs for diagnosis (shows an example of an O2 signal). 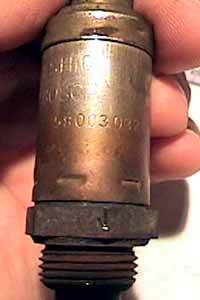 More on the O2 sensor. 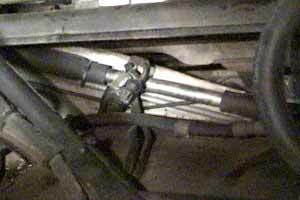 Feedback fuel systems (some useful techniques for dual channel DSOs). OBD II improvements to O2 testing (mostly note the bits about sluggishness == coated sensor). A nice sub document from a larger document on Engine Management systems, this one obviously zoning in on the O2 sensors. 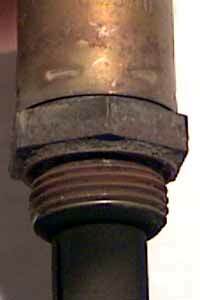 A heady SAE Document discussing O2 sensor design and theory. Some bloke has collected up some pertinent bits of O2 Sensor wisdom. 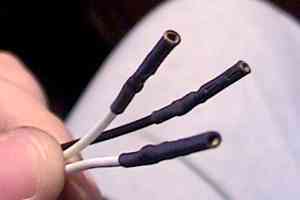 There's also the point of the use of O2 sensors in A/F Metres. This is a collection of messages pertaining to the oxygen sensor from a VW mailing list. Not nearly as well organized as the above references, but there's an occasional scrap in there. 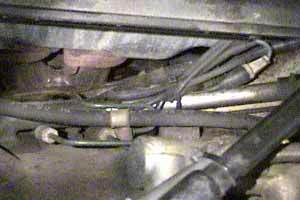 This is the original sensor harness in place, taken from the LHS wheel well, with the steering banked to centre (when working on the on the LHS, turn the wheels to the right, and when working on the RHS, turn them to the left). 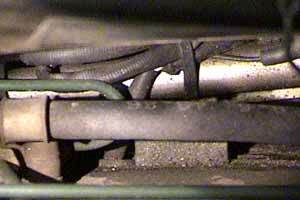 The O2 wire enters the top of the wheel well (through a grommet), passes along the inside, where it eventually meets up with an anchor clip (to retain it to the wall of the wheel well), and then passes under the wheel well, where the sensor is threaded into the exhaust downpipe (see further below for closeups of that). 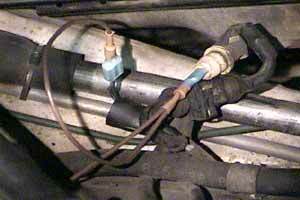 There is a special O2 sensor socket you can pick up for a few dollars which is a deep well which fits the O2 sensor hex, and has a slice out the side so the wire harness comes out the side of the socket. This will run you about US$15-20 or so at any autoparts store with a reasonable tool offering (i.e. something more than cheapo toolkits from Taiwan). You might look around for a shop carrying Lisle brand products - they should have a catalogue, and the part you're looking for is #12100. 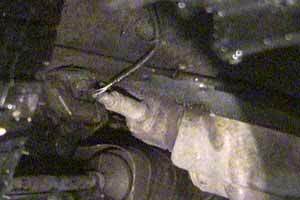 Note that for installing and uninstalling it, you should disconnect the connection(s) in the engine compartment and pass the wire through the wheel well and have the wire free when you're threading the sensor in or out (this avoids wrapping the wire). Eyeball where the wire passes through the grommet into the engine compartment, and then look under the bonnet for it there. 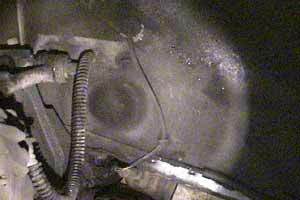 You should see something similar to the above, when looking down on the LHS (B-Bank) side of the engine compartment (the same side as the wheelwell photo of the sensor above was taken). 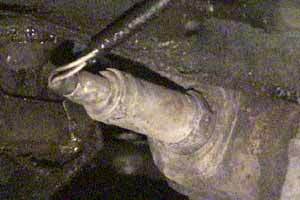 Inside that rubber insulator boot is simply an 0.25" spade connection, which you can pull apart to disconnect. 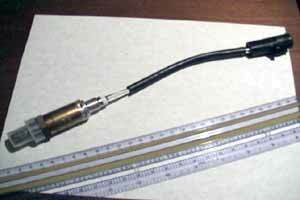 If you have a three wire (heated) O2 sensor, there is an additional connector for the heater - THIS wire is the O2 signal itself, and is the wire you'd tap if you wanted to take readings from the O2 sensor for in-situ sensor testing. 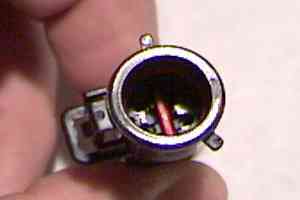 The connections (this is for a three wire heated sensor, as is present on the 1988 XJ-SC that this sensor retrofit was performed on). Note that the signal is a black wire, and the heater is a pair of white wires. The heater has no specific polarity (either white wire can be ground with the other being +V). 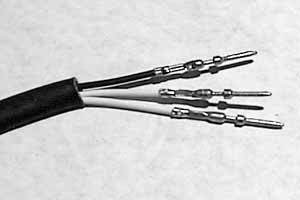 In my case (and perhaps yours as well), the A bank afforded a better shot of BOTH of the connectors for the three wire sensor. Note the wiretie retaining the sensor plugs (you don't want these wobbling around - they're near the top of the exaust manifolds). 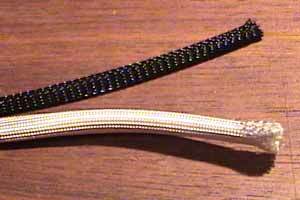 Just carefully snip the wiretie with wire snips and discard the wiretie to replace it later with a new one when you're done with the project. 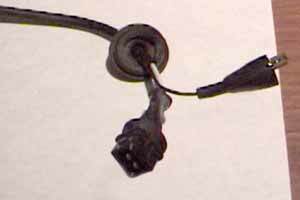 You may consider using a releaseable wiretie as I do. 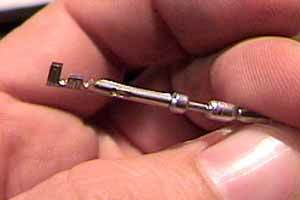 Here, I've tapped the A bank O2 sensor signal wire using a "tee" adapter fashioned from a wire with a male and a female 0.25" spade on either tip of the tee, and an appropriate connector at the base of the tee for connecting to my oscilloscope. This allows me to take measurements of the O2 sensor in-situ - the sensor does not need to be removed from the automobile for me to see what sort of shifts in signal I get, and I can actually see the shifts as waveforms, permitting me to make a judgement call as to whether they're sluggish or not (if they don't cycle lo/hi fast enough, the O2 sensors are worn). 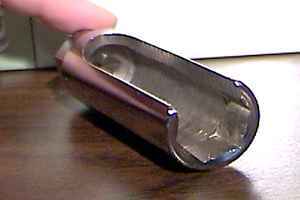 I can induce a high O2 reading by disconnecting an injector boot, and reduce O2 by opening the valve to a propane torch (unlit) placed into the air cleaner horn on the measured side. 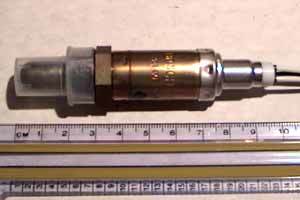 Note that to measure the cycle period of the sensor, the ECU needs to be in closed loop (i.e. 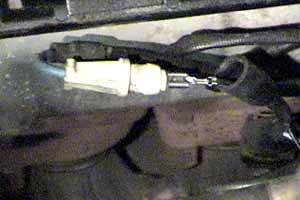 the test plug needs to be removed from the ECU in the boot, so that the ECU is paying attention to the sensor while you're in park), and of course, the sensor must be up to operating temperature (give it a few minutes with the heated sensor, though I can't speak for the unheated variety). 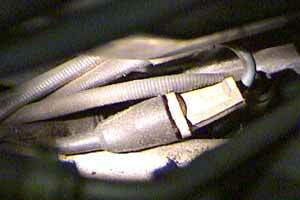 Don't forget to replace the test plug in the boot when you're done testing. 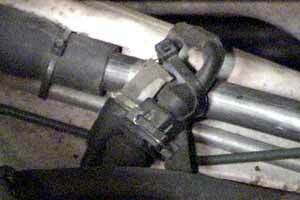 The steering linkage is visible below and forward of the sensor. 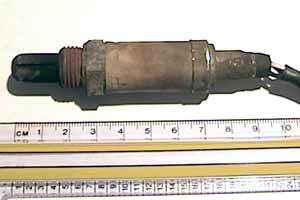 Closeups of the O2 sensor itself. 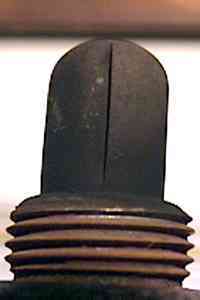 You can see the carbon buildup on the sensor tip. The threads on the replacement should come pre-coated with antisieze compound, and if not (or if you're reinstalling your originals, especially after testing them), you should give them a good coating. 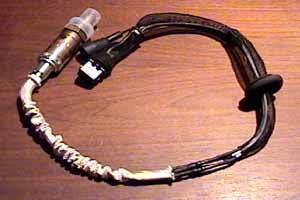 Our original O2 sensor harness, extracted from the automobile. Here we have the Thunderbird sensor new just out of the box. This wire isn't long enough for the length we need for the XJS -- while they sold the same sensor with a longer harness, I didn't feel like paying the premium for it. The old sensor, and the new sensor. Note that the plastic cap should remain on the new sensor until you are ready to install it -- it not only protects the sensor element, but also keeps the antisieze compound which is on the threads from getting everywhere (that stuff really likes to travel). 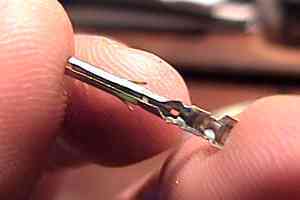 The Thunderbird connector (which, if I could have easily located a pair of mating plugs, I would have simply used, since that would have made future installs a simple plug-it-in affiar, and it is a watertight connector), and the pins extracted from it. This is a closeup of a female molex contact used to mate with the male molex pin that is present on the Ford Thunderbird O2 sensors which I used. We also have a shot showing the connectors plugged together with a snug fit, ensuring that we have the proper size pins. 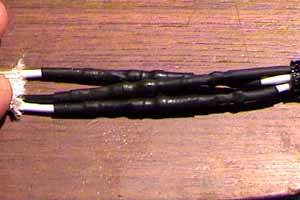 The mating female and male insulated pins. Closeup of the glassfibre insulator (white) and the nylon fishnet retaining tube (black). The insulation and retaining material is installed at opposite ends of the harness (the electrical contacts are in the middle of the harness), with the grommet also on the wire. Don't forget to have the grommet on there before you proceed. The completed harness with the glass fibre insulator on the inside of the nylon fishnet mesh retainer. Ready for reinstallation.